339 Marlborough is located on the north side of Marlborough, between Gloucester and Hereford, with 337 Marlborough to the east and 341 Marlborough to the west. 339 Marlborough was built ca. 1872 for builder and contractor George Martin Gibson, for speculative sale, one of eleven contiguous houses (337-339-341-343-345-347-349-351-353-355-357 Marlborough). Click here for an index to the deeds for 339 Marlborough. On June 20, 1873, 339 Marlborough and 341 Marlborough were purchased from Hiram Gerrish by attorney Charles Eustis Hubbard. He and his wife, Caroline Dennie (Tracy) Hubbard, made 339 Marlborough their home. They had married in December of 1872. In November of 1873, he sold 341 Marlborough to Caroline Hubbard’s brother and sister-in-law, James Dennie Tracy and Hannah Maria (Gibbs) Tracy, who made it their home. They also had married in December of 1872. On August 1, 1874, Charles Hubbard transferred 339 Marlborough into Caroline Hubbard’s name. The Hubbards continued to live at 339 Marlborough during the 1882-1883 winter season, but moved thereafter a new home they had built at 386 Marlborough. On April 23, 1883, 339 Marlborough was purchased from Caroline Hubbard by Elizabeth Bowditch (Frothingham) Brown Parker, the wife of William Lincoln Parker. They had married in January of 1883 and 339 Marlborough probably was their first home together. They also maintained a home in Cohasset. William Parker was a shipping merchant in the firm of Hemenway & Browne. Brooks Frothingham, Elizabeth Frothingham’s son by her first marriage to Henry Temple Brown, lived with them. In the mid-1890s, he attended Harvard and then MIT, where he graduated in architecture. After his graduation, he continued to live with his mother and step-father. He was an architect with the firm of Fehmer and Page. Sometime in the late 1880s or 1890s, the Parkers remodeled 339 Marlborough, eliminating the mansard roof and adding a story. It is shown as three stories plus basement on the 1887 Sanborn map, and as four stories plus basement on the 1897 map. The Parkers and Brooks Frothingham continued to live at 339 Marlborough during the 1901-1902 winter season. Brooks Frothingham married in June of 1902 to Grace Adele Clark and they moved to 755 Boylston. By the 1902-1903 season. the Parkers had moved to 312 Dartmouth. Elizabeth Parker continued to own 339 Marlborough and lease it to others. 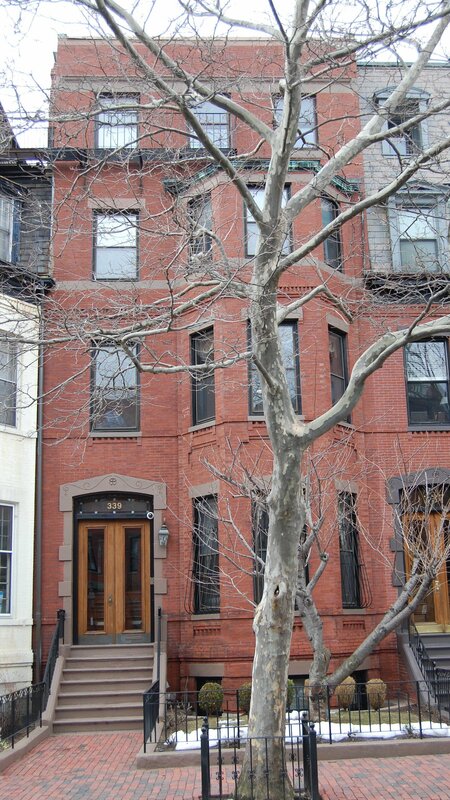 In May of 1908, Mary and Lucy Isabelle May purchased 337 Marlborough, and on June 3, 1912, Mary May purchased 339 Marlborough from Elizabeth Parker. 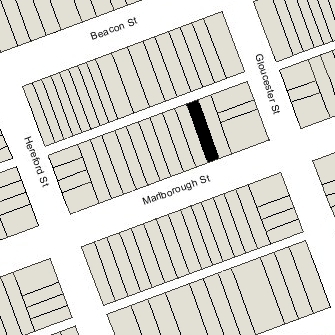 From 1910, some staff (and possibly some students) lived at 337-339 Marlborough. On August 15, 1930, 339 Marlborough was acquired from George Maloof by Ella J. (O’Connell) Good, the widow of Dr. John Patrick Good, a dentist. Their daughter, Julia P. Good, lived with her. She was a teacher They previously had lived in Cambridge. They operated 339 Marlborough as a lodging house. On June 30, 1932, Ella Good transferred the property to her daughter. Ella Good and Julia Good continued to live at 339 Marlborough during the 1934-1935 winter season, but moved thereafter to 226 Bay State Road. 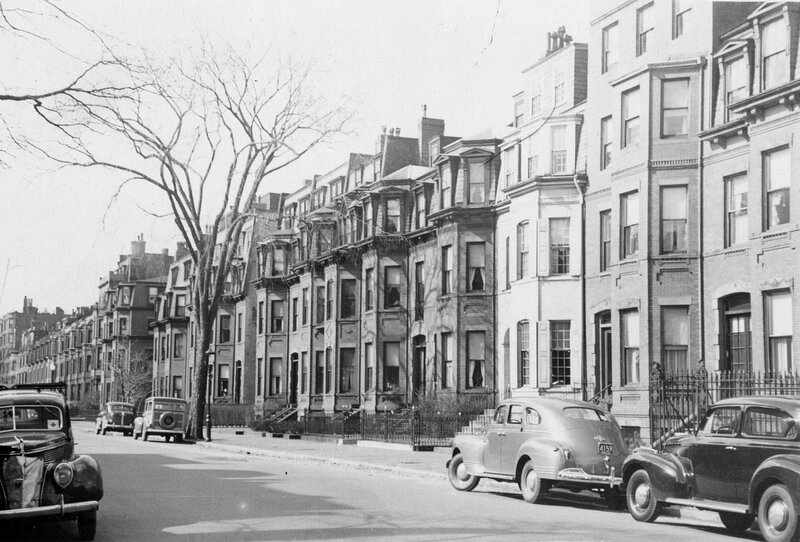 On October 21, 1935, the Massachusetts Hospital Life Insurance Company foreclosed on its mortgage and took possession of 339 Marlborough. By 1936, 339 Marlborough was the home of Helen (Taylor) Hunt, the widow of Arthur P. Hunt, who operated it as a lodging house. She previously had been a lodger at 386 Marlborough. She continued to live at 339 Marlborough in 1937, but moved thereafter to 177 Beacon. 339 Marlborough was shown as vacant in the 1939 City Directory. On August 31, 1939, 339 Marlborough was acquired from Massachusetts Hospital Life Insurance by Millard A. Westover and his wife, Louise Scott (George) Thornton Westover. They lived at 142 St. Botolph, where they operated a lodging house. Louise Westover died in 1940 and Millard Westover married again, in 1941, to Mrs. Myra Maude (called Maude) (Hagan) Moulton, the widow of Charles A. Moulton. They continued to live at 142 St. Botolph. On December 22, 1941, he transferred 339 Marlborough into both of their names. 339 Marlborough continued to be a lodging house with several different operators during the 1940s and 1950s. Millard Westover died in 1950, and In about 1962, Maude Westover made 339 Marlborough her home. She continued to live there and operate it as a lodging house until shortly before her death in March of 1968. On July 20, 1967, 339 Marlborough was acquired from the National Shawmut Bank of Boston, conservator of Maude Westover’s property, by Octavia Morley (Sawyer) Walsh, the widow of Edward M. Walsh. She lived at 78 Marlborough. On July 31, 1967, 339 Marlborough was acquired from Octavia Walsh by real estate dealer Joseph E. Coppola. On April 11, 1977, he transferred the property to Coppola Properties, Inc.
On August 19, 1982, 339 Marlborough was acquired from Coppola Properties by Louise Lilienfeld. In March of 1984, she filed for (and subsequently received) permission to convert the property from a lodging house into a single-family dwelling and doctor’s office. In April of 2000, Louise Lilienfeld applied for (and subsequently received) permission to convert the property into a single-family dwelling. On May 1, 2000, 339 Marlborough was purchased from Louise Lilienfeld by George M. Locarno and his wife, Jayne C. Enos. In August of 2006, he applied for permission to construct a two-car garage, with a deck on top, at the rear of the property. The application was denied and his appeal was dismissed (without prejudice) by the zoning Board of Appeal. 339 Marlborough remained a single-family dwelling in 2017.